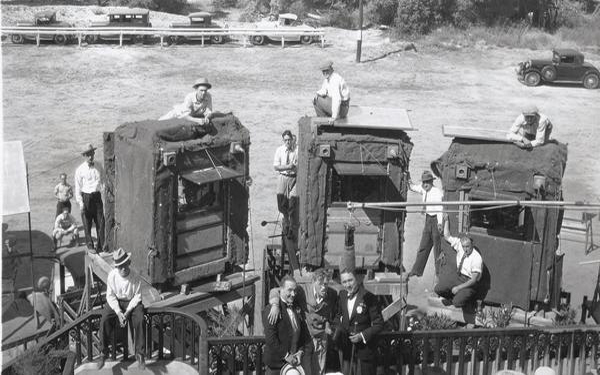 Technicolor cameras housed in sound proof booths filming "Fifty Million Frenchmen," 1931. Most feature films made during the Golden Age of Hollywood were in black and white, so audiences were dazzled when a movie exploded in Technicolor. The rich, flamboyant use of Technicolor in such late 1930s classics as “Snow White and the Seven Dwarfs,” “The Adventures of Robin Hood,” “The Wizard of Oz” and “Gone With the Wind” enchants audiences in the digital era. But it took nearly two decades for Technicolor to become so glorious. “The Dawn of Technicolor: 1915-1935,” an exhaustively researched book published by the George Eastman House and written by James Layton and David Pierce, explores the early years of Technicolor and includes some 400 photographs and an annotated filmography for the early two-strip process that, because of technical limitations of the time, couldn’t replicate natural blues, purples and yellows. Technicolor was founded a century ago by Herbert T. Kalmus, a graduate of the Massachusetts Institute of Technology and a physicist; fellow MIT graduate Daniel F. Comstock, who was an engineer, physicist and professor; and mechanical engineer and inventor W. Burton Wescott. Kalmus, Comstock and Wescott didn’t have any experience in motion pictures, Layton said, but they saw opportunity when a British color system called Kinemacolor was proving problematic. He took the sample of the film back to the lab, and his team tried to improve it, Layton said. Noted film historian, archivist and author Pierce said the then-new company Technicolor was similar to the modern Silicon Valley start-up. “They raised investments from Boston bankers, railroad magnates, people who were looking to invest their fortune that could turn out to be very profitable,” Layton added. Technicolor’s first film, “The Gulf Between” in 1917, was a disaster. The company had technical problems in the presentation and had to go back to the drawing board. Five years later, the company’s next film, “The Toll of the Sea,” was a marked improvement in photography and color design. Still, Layton said, the two-strip process couldn’t reproduce the full spectrum, so Technicolor had to control a film’s palette carefully. New makeup had to be created because the makeup used in black-and-white films looked artificial. Technicolor sometimes needed as much as five times the light of a black-and-white film. Banks of lights were needed to illuminate enormous stages, Layton said. Temperatures inside the studios became unbearable. “There are stories of actors’ makeup just sort of dripping off their faces,” Layton said. Though Layton and Pierce documented 371 films that were entirely shot or featured sequences in the two-strip process, they found no proof that color drove ticket sales, Pierce said. Silent screen superstar Douglas Fairbanks used Technicolor in his 1926 swashbuckler “The Black Pirate,” Pierce said, but he used it for artistic purposes. Technicolor’s fortunes boomed in 1929 and early 1930 when Warner Bros. gave the company a lucrative contract to make several color musicals. But with so many movies in the pipeline, the quality of the prints suffered. Audiences grew tired of stagy musicals. Because color was so closely associated with musicals, Warner Bros. pulled the plug. It was the three-strip Technicolor process, which replicated the full spectrum, that saved the company.